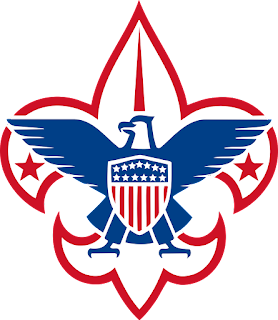 The Boy Scouts of America offers two high-level leadership and management courses for BSA leaders that are internationally recognized so much that many companies will give time off and/or pay for Scouters to attend the courses, as it makes them not only a better Scout Leader, but a better employee, spouse, and parent. Generally, it is suggested that you attend Wood Badge Basic Leadership Training before you attend Seabadge Advanced Leadership Training, as Seabadge will take the skills you learned in Wood Badge to an all new level. Wood Badge is celebrating it's 70th anniversary this year and Seabadge will celebrate it's 50th anniversary in 2020. 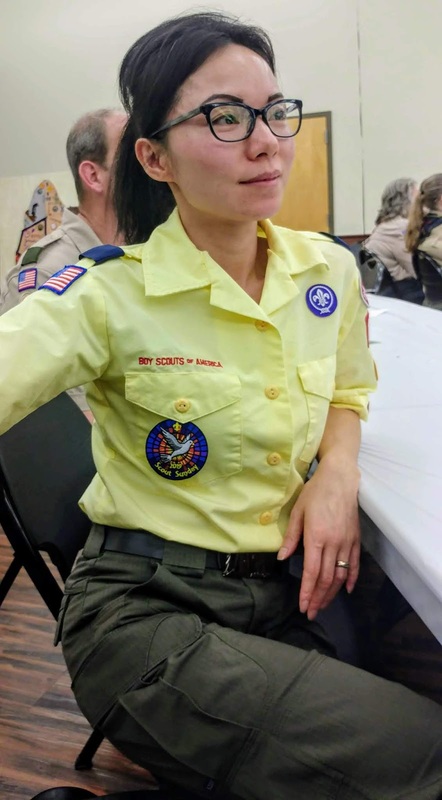 The purpose of Wood Badge Basic Leadership Training is to develop skilled leaders who can strengthen Scouting units in achieving the mission of the Boy Scouts of America. Open to adults, including Scouters in any BSA program and Venturers and Sea Scouts ages 18 and older. The Wood Badge course is either held as a 6-day course or two 3-day courses and is run by the local council. Besides position specific training, Leaders of each Scouting program have other preresiquites before they can take Wood Badge. Wood Badge teaches participants the basics of listening, managing conflict, leading change, stages of team development, coaching & mentoring, leadership for different stages, servant leadership, project planning, communicating, valuing people, and more. Once the skill is learned, each member is given the opportunity to use the skill as a member of a successful working team. At the conclusion of the course, each participant develops a set of personal goals related to his or her Scouting role known as "the Ticket." Working toward these goals allows each participant to practice and demonstrate new skills. Seabadge Advanced Leadership Training teaches leadership skills for unit, district, and council Scout leaders. Seabadge is intense leadership and management training focused on the “how-to” aspects of managing a successful youth led Scout program. While Seabadge was originally developed as an advanced leadership training program for experienced Sea Scout adult leaders the course is open to all adult Scout leaders. The driving theme for the training is to “Focus on Youth”, which makes the course especially valuable for any Scout leader dealing with older youth. Seabadge does not cover topics like boating, knots, or other program-related materials found in the Sea Scout Manual. Seabadge is an intensive 3-day course. Course participants and staff function as a model ship to help participants understand how a ship or youth-led unit should function. The curriculum includes twenty sessions, with established objectives, that are presented in a motivating and informative forum. After the course, participants have 18 months to complete their Praxis, (previously known as the Rutter) similar to the Wood Badge Ticket. Use the skills and tools acquired at Seabadge to improve the quality of their Scouting program. Has completed the basic training courses for their Specific Scouting position(s) and Leader Specific: Sea Scout Adult Leader Basic Training. 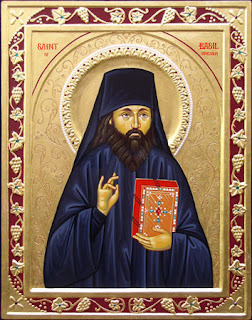 While it is somewhat common knowledge to many Scouts that Saint George the Trophy-Bearer of Cappadocia is the patron saint of Scouting, and that Sea Scouts share the same patron along with Saint Nicholas the Wonderworker of Myra in Lycia, Saint Brendan the Navigator of Ireland, and Saint Cormac of the Sea, many may not know that some modern Orthodox Christian Saints were involved in Scouting. 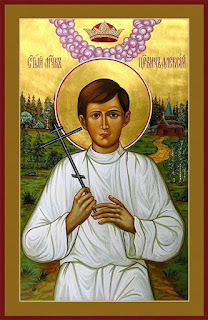 I only list a few more prominent saints, but I am sure there are many more Orthodox Christian Saints that were involved in Scouting as well. I will post more about the lives of these holy saints of Scouting in the upcoming months. Holy Orthodox Scouts and Scouters, Pray unto God for us! 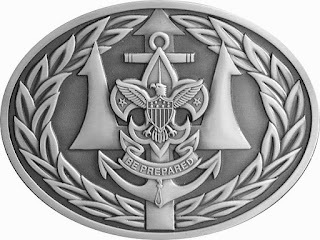 Founded in 1999 by a Venturing Crew, the purpose of the Corps of Discovery (COD) is to promote a stand alone servant leadership and service program within our home communities or religious institutions that youth groups, especially Venturing Crews, Sea Scout Ships, Scout Troops, and Exploring Posts can use to enhance their program and to service regardless of the endorsement of any national organization. The mission is to provide servant leadership to youth and adult members of youth groups through leadership training, program development, and service projects. The COD is not an honor society so much as it is a unit-based co-educational Service organization. To be a member, one must simply be willing to commit to doing service, and ask to join the Corps of Discovery. The COD takes its name and symbolism from Lewis and Clark's historic Voyage of Discovery. The Corps of Discovery is a Service Society for the youth and adults who have shown a willingness to promote service within their Scouting organizations, communities or within their religious institutions. It is intended for youth and adults who have gone beyond what would normally be expected by a unit member or unit leader; ones that provide widespread service. It should not be thought of as an inclusive precursor to the (newly made Co-Ed) Order of the Arrow (OA). It is a totally different animal. One must not choose between membership in one or the other. In fact, many CoD members are also OA members. The Order of the Arrow is an optional Honor Society whose purpose is to promote camping in Boy Scouting. It is structured into a Lodges like Freemasonry. It's theme is based in American Indian culture, and its ceremonies involved dressing up as Native Americans. The Corps of Discovery is a Service Society whose purpose is to provide service to Venturing, Scouting, Exploring, and our communities. It's theme is Servant Leadership and it is based on the Lewis and Clark Expedition. The moment depicted on the current pocket flap is when Sacagawea recognized her brother, Cameawhait, upon her return to Western Montana. She had been kidnapped by a rival tribe as a young girl and was returning to her home territory for the first time — as a member of the Corps of Discovery. The reason this moment is so important is because the Corps was in danger of failing at that moment, as they needed horses and directions in order to cross the Bitterroot Mountains into Idaho and Eastern Washington State before winter, which her brother provided. The first pocket flap was a depiction of Meriwether Lewis and William Clark at the white bluffs of the Missouri Breaks at the moment they (thought they) could see the Continental Divide. It turned out they were seeing the Bearpaw Mountains and were a week or so away from the Rockies. The next pocket flap, which has not yet been designed, may show the leaders of the Corps voting on whether to spend the winter on the Washington State side of the Columbia River or to cross over to Oregon to winter near the present site of Astoria. 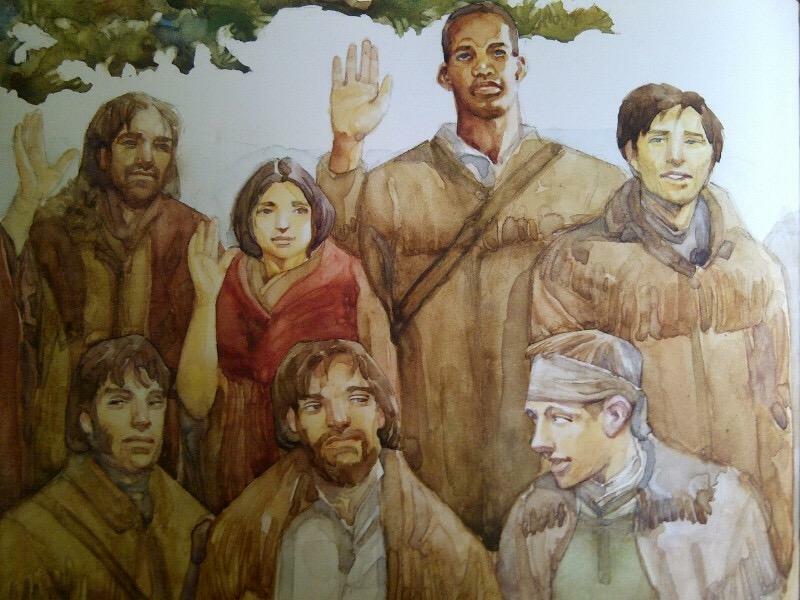 Everyone in the Corps got a vote, including Sacagawea and York, Clark's slave. This was almost certainly the first time in American history that a woman and a black man got to vote in a major decision. The Corps voted to move to the southern shore of the Columbia and wintered at Fort Clatsop, a small log compound which they built themselves. "The Corps of Discovery is a Service Society based on one of the greatest adventures in American history. The Order of the Arrow is an Honor Society based loosely on American Indian culture and Masonry." The fact that the COD takes its name and symbolism from Lewis and Clark's historic Voyage of Discovery. It is a service organization and not an honor society of lodges. Both males and females have always been able to belong to the Corps. To become a member, one must simply be willing to commit to doing service (a pay it forward concept). For more information on the Corps of Discovery and how to join, please see https://www.TheCorpsOfDiscovery.org & https://www.SageThinking.org/COD.shtml as well as on Facebook at https://www.facebook.com/groups/16213695514/. The Great Martyr Anastasia the Deliverer from Potions, a Roman by birth, suffered for Christ at the time of Diocletian’s persecution of Christians. Her father was a pagan, but her mother was secretly a Christian. Saint Anastasia’s teacher in her youth was an educated and pious Christian named Chrysogonus. After the death of her mother, her father gave Saint Anastasia in marriage to a pagan named Publius, but feigning illness, she preserved her virginity. Clothing herself in the garb of a beggar, and accompanied by only one servant, she visited the prisons. She fed, doctored and often ransomed captives who were suffering for their faith in Christ. When her servant told Publius about everything, he subjected his wife to a beating and locked her up at home. Saint Anastasia then began to correspond secretly with Chrysogonus, who told the saint to be patient, to cleave to the Cross of Christ, and to accept the Lord’s will. He also foretold the impending death of Publius in the sea. After a certain while Publius did indeed drown, as he was setting out with a delegation to Persia. After the death of her husband, Saint Anastasia began to distribute her property to the poor and suffering. Diocletian was informed that the Christians who filled the prisons of Rome stoically endured tortures. He gave orders to kill them all in a single night, and for Chrysogonus to be sent to him at Aquileia. Saint Anastasia followed her teacher at a distance. The emperor interrogated Chrysogonus personally, but could not make him renounce his faith. Therefore, he commanded that he be beheaded and thrown into the sea. The body and severed head of the holy martyr were carried to shore by the waves. There by divine Providence, the relics were found by a presbyter named Zoilus who placed them in a coffer, and concealed them at his home. Saint Chrysogonus appeared to Zoilus and informed him that martyrdom was at hand for Agape, Chione and Irene (April 16), three sisters who lived nearby. He told him to send Saint Anastasia to them to encourage them. Saint Chrysogonus foretold that Zoilus would also die on the same day. Nine days later, the words of Saint Chrysogonus were fulfilled. Zoilus fell asleep in the Lord, and Saint Anastasia visited the three maidens before their tortures. When these three martyrs gave up their souls to the Lord, she buried them. Having carried out her teacher’s request, the saint went from city to city ministering to Christian prisoners. Proficient in the medical arts of the time, she zealously cared for captives far and wide, healing their wounds and relieving their suffering. Because of her labors, Saint Anastasia received the name Deliverer from Potions (Pharmakolytria), since by her intercessions she has healed many from the effects of potions, poisons, and other harmful substances. She made the acquaintance of the pious young widow Theodota, finding in her a faithful helper. Theodota was taken for questioning when it was learned that she was a Christian. Meanwhile, Saint Anastasia was arrested in Illyricum. This occurred just after all the Christian captives there had been murdered in a single night by order of Diocletian. Saint Anastasia had come to one of the prisons, and finding no one there, she began to weep loudly. The jailers realized that she was a Christian and took her to the prefect of the district, who tried to persuade her to deny Christ by threatening her with torture. After his unsuccessful attempts to persuade Saint Anastasia to offer sacrifice to idols, he handed her over to the pagan priest Ulpian in Rome. The cunning pagan offered Saint Anastasia the choice between luxury and riches, or grievous sufferings. He set before her gold, precious stones and fine clothing, and also fearsome instruments of torture. The crafty man was put to shame by the bride of Christ. Saint Anastasia refused the riches and chose the tools of torture. But the Lord prolonged the earthly life of the saint, and Ulpian gave her three days to reconsider. Charmed by Anastasia’s beauty, the pagan priest decided to defile her purity. However, when he tried to touch her he suddenly became blind. His head began to ache so severely that he screamed like a madman. He asked to be taken to a pagan temple to appeal to the idols for help, but on the way he fell down and died. Saint Anastasia was set free and she and Theodota again devoted themselves to the care of imprisoned Christians. 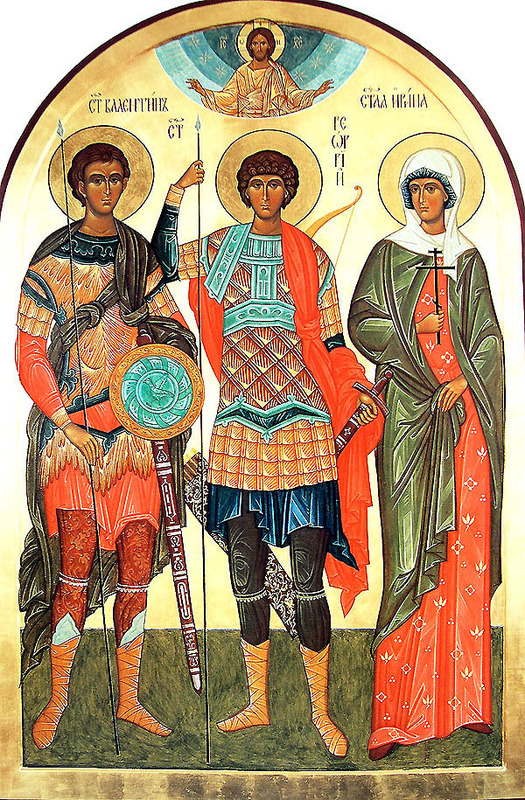 Before long, Saint Theodota and her three sons accepted a martyrdom. Her eldest son, Evodus, stood bravely before the judge and endured beatings without protest. After lengthy torture, they were all thrown into a red-hot oven. Saint Anastasia was caught again and condemned to death by starvation. She remained in prison without food for sixty days. 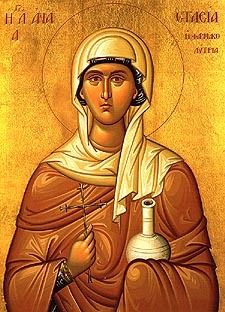 Saint Theodota appeared to the martyr every night and gave her courage. Seeing that hunger caused Saint Anastasia no harm whatsoever, the judge sentenced her to drowning together with other prisoners. Among them was Eutychianus, who was condemned for his Christian faith. The prisoners were put into a boat which went out into the open sea. The soldiers bored holes in the boat and got into a galley. Saint Theodota appeared to the captives and steered the ship to shore. When they reached dry land, 120 men believed in Christ and were baptized by Saints Anastasia and Eutychianus. All were captured and received a martyr’s crown. Saint Anastasia was stretched between four pillars and burned alive. A certain pious woman named Apollinaria buried her body, which was unharmed by the fire, in the garden outside her house. In the fifth century the relics of Saint Anastasia were transferred to Constantinople, where a church was built and dedicated to her. Later the head and a hand of the Great Martyr were transferred to the monastery of Saint Anastasia Deliverer from Potions, near Mount Athos. “I love You, my Bridegroom, and in seeking You I endure suffering. And, striving valiantly, you overcame the enemy. For all who come to you, O godly-minded Anastasia! Saint Nicholas, Enlightener of Japan, was born Ivan Dimitrievich Kasatkin on August 1, 1836 in the village of Berezovsk, Belsk district, Smolensk diocese, where his father served as Deacon. At the age of five he lost his mother. He completed the Belsk religious school, and afterwards the Smolensk Theological Seminary. In 1857 Ivan Kasatkin entered the Saint Peterburg Theological Academy. 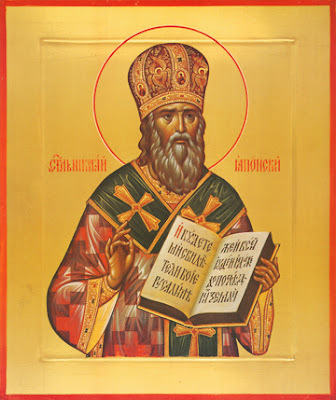 On June 24, 1860, in the academy temple of the Twelve Apostles, Bishop Nectarius tonsured him with the name Nicholas. On June 29, the Feast of the foremost Apostles Peter and Paul, the monk Nicholas was ordained deacon. The next day, on the altar feast of the academy church, he was ordained to the holy priesthood. Later, at his request, Father Nicholas was assigned to Japan as head of the consular church in the city of Hakodate. At first, the preaching of the Gospel in Japan seemed completely impossible. 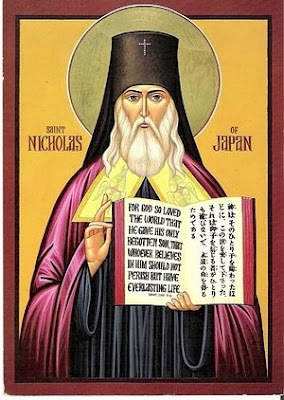 In Father Nicholas’s own words: “the Japanese of the time looked upon foreigners as beasts, and on Christianity as a villainous sect, to which only villains and sorcerers could belong.” He spent eight years in studying the country, the language, manners and customs of the people among whom he would preach. In 1868, the flock of Father Nicholas numbered about twenty Japanese. At the end of 1869 Hieromonk Nicholas reported in person to the Synod in Peterburg about his work. A decision was made, on January 14, 1870, to form a special Russian Spiritual Mission for preaching the Word of God among the pagan Japanese. 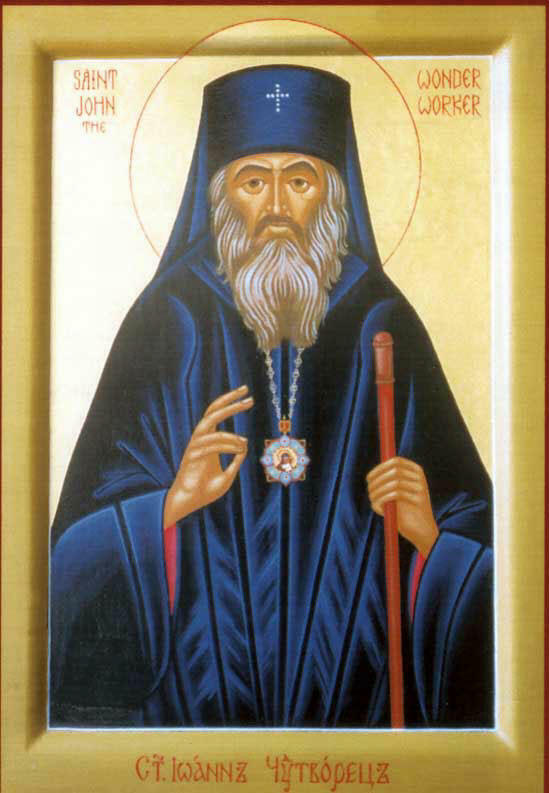 Father Nicholas was elevated to the rank of archimandrite and appointed as head of this Mission. Returning to Japan after two years in Russia, he transferred some of the responsibility for the Hakodate flock to Hieromonk Anatolius, and began his missionary work in Tokyo. In 1871 there was a persecution of Christians in Hakodate. Many were arrested (among them, the first Japanese Orthodox priest Paul Sawabe). Only in 1873 did the persecution abate somewhat, and the free preaching of Christianity became possible. In this year Archimandrite Nicholas began the construction of a stone building in Tokyo which housed a church, a school for fifty men, and later a religious school, which became a seminary in 1878. In 1874, Bishop Paul of Kamchatka arrived in Tokyo to ordain as priests several Japanese candidates recommended by Archimandrite Nicholas. At the Tokyo Mission, there were four schools: for catechists, for women, for church servers, and a seminary. At Hakodate there were two separate schools for boys and girls. In the second half of 1877, the Mission began regular publication of the journal “Church Herald.” By the year 1878 there already 4115 Christians in Japan, and there were a number of Christian communities. Church services and classes in Japanese, the publication of religious and moral books permitted the Mission to attain such results in a short time. Archimandrite Nicholas petitioned the Holy Synod in December of 1878 to provide a bishop for Japan. Archimandrite Nicholas was consecrated bishop on March 30, 1880 in the Trinity Cathedral of Alexander Nevsky Lavra. Returning to Japan, he resumed his apostolic work with increased fervor. 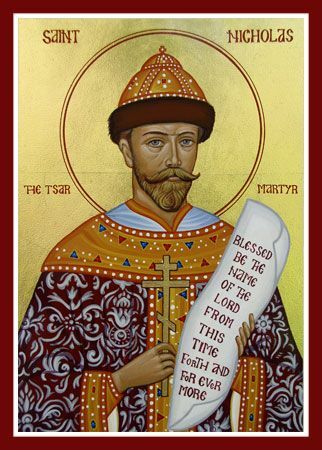 He completed construction on the Cathedral of the Resurrection of Christ in Tokyo, he translated the service books, and compiled a special Orthodox theological dictionary in the Japanese language. Great hardship befell the saint and his flock at the time of the Ruso-Japanese War. For his ascetic labor during these difficult years, he was elevated to the rank of Archbishop. In 1911, half a century had passed since the young hieromonk Nicholas had first set foot on Japanese soil. At that time there were 33,017 Christians in 266 communities of the Japanese Orthodox Church, including 1 Archbishop, 1 bishop, 35 priests, 6 deacons, 14 singing instructors, and 116 catechists. On February 3, 1912, Archbishop Nicholas departed peacefully to the Lord at the age of seventy-six. The Holy Synod of the Russian Orthodox Church glorified him on April 10, 1970, since the saint had long been honored in Japan as a righteous man, and a prayerful intercessor before the Lord. He is commemorated on February 16th in the New Calendar and February 3rd on the old calendar. For his successful apostolic and evangelistic efforts, he was named Equal-to-the-Apostles and the Apostle to Japan. A vessel overflowing with the love of Christ. For all your flock and for the whole world. 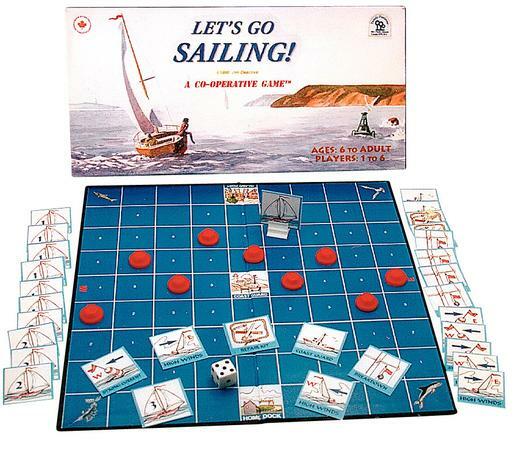 Recently I got a Co-Operative Game from Family Pastimes called "Let's Go Sailing!". It looked interesting, so we played it and I was surprised just how much everyone loved playing the game. It took a lot of cooperation and planning to win, but a lot of luck is involved too! It is meant for 1-6 players, aged 6-Adult. "You are a sailing crew taking your Sailboat from Home Dock to the Island Port. When you get safely there, celebrate a great day of sailing by breaking out rations of milk and cookies. Then it’s hoist anchor and set sail for home again. Sailing is a challenge, demanding the best effort from everyone on the crew. Everyone’s contribution is valued. Each of us has a supply of Action Cards that we share with each other. We use them to advance the boat, negotiate Strong Currents and High Winds, while trying to avoid Rocks and Reefs. In each game, the location of the Reefs is different. We must keep a Seadog’s eye out for potential Breakdowns that could ground us. Save the Coast Guard cards in case we need to be rescued. Or else we could end up being adrift at sea!" Sounds fun right? Well it is! It even won Dr. Toy's Game of the Year Award! This game is perfect for a family, a Sea Scout Ship, a Boy Scout Patrol, a Maritime Exploring Club, a Venturing Crew, or even a Cub Scout Den. 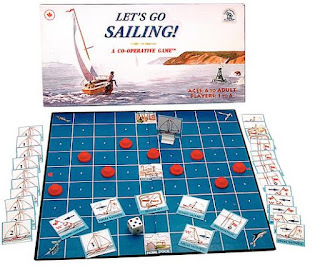 Family Pastimes also has many more co-operative games about Deep Sea Scuba Diving, Exploring, Search & Rescue, Hiking, Mountaineering, Weather, Birding, etc. I'll probably be checking out at least a few if them. Most of their games can be found HERE. 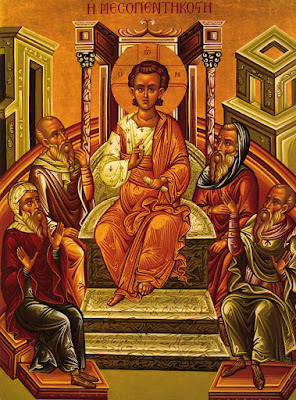 The Hieromartyr Bishop Valentine and his three disciples, Proculus, Ephebus and Apollonius, and the righteous Abundius lived during the third century. Saint Valentine was a bishop in Umbria (now Italy), in the city of Interamna. He received from God the gift of healing various maladies. At this time three pagan youths, Proculus, Ephebus and Apollonius, came from Athens to Rome to study.They found a tutor named Craton, and lived in his home. Craton’s son Cherimon fell grievously ill, and his spine was so contorted that his head was bent down to his knees. Craton asked Bishop Valentine to help his sick son. The holy bishop went into the sick child’s room and prayed fervently all night. When day came, the happy parents saw their son had been healed. They believed in Christ and were baptized with all their household. Craton’s students, Proculus, Ephebus and Apollonius were also baptized and became devoted disciples of Saint Valentine. The bishop’s fame quickly spread, and many were converted to Christ. Among them was the city prefect’s son, Abundius, who openly confessed himself a Christian. This was a bold thing to do, since paganism prevailed in the world, and Christianity was persecuted. The wrath of the prefect and other city leaders fell upon Bishop Valentine, the teacher of the youths. They demanded that he renounce Christ and worship the idols. After much torture they threw him into prison, where his followers visited him. Learning of this, the prefect gave orders to take Valentine out of the prison and behead him. Saint Valentine’s students Proculus, Ephebus, and Apollonius took the body of their teacher and carried it to the city of Interamnum, where they buried it. Both believers and pagans were drawn to them, and they converted many idolaters to the true Faith. When the authorities heard about this, they arrested the youths and threw them in prison. Fearing that people might break the sufferers out of prison, the executioners beheaded them by night. Abundius, learning that his friends had been locked in prison, hastened to see them, but found that they had already been executed. He buried their bodies near the grave of holy Bishop Valentine. During the reign of the emperor Claudius II (268-270), Saint Marinus together with his wife Martha and their sons Audifax and Habakkuk journeyed from Persia to Rome, to pray at the graves of the holy Apostles Peter and Paul. During this time fierce persecutions and executions befell the Roman Church. Saint Marinus and his wife and sons helped Christians locked up in the prisons, and also requested the bodies of executed martyrs. At one of these jails they met a prisoner named Cyrenus and they helped him, since he had endured many torments for faith in Christ. The persecution spread, and even more Christians were arrested. During this time 260 Christians, among whom was the tribune Vlastus, had been sent under the court sentence to dig ground along the Salerian Way, and were executed by archers. When they learned about this vicious murder, Marinus, his family, and the presbyter John went by night and took the bodies of the martyrs to be buried in the catacombs. They returned later to the prison where Saint Cyrenus was incarcerated, but did not find him. He had been executed the day before and his body was thrown into the Tiber River. Doing their holy duty, Saints Marinus and Martha and their sons took the body of the holy martyr from the river and committed it to the earth. 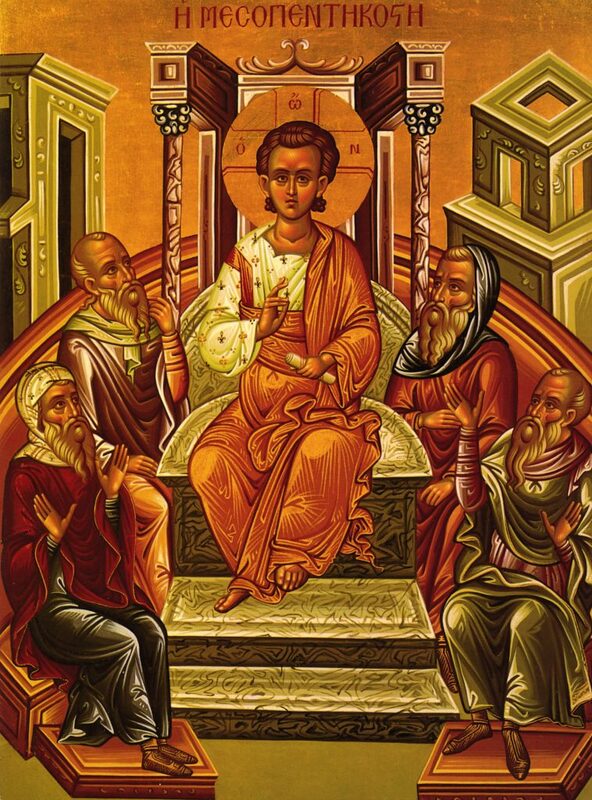 The holy workers were among Christians, who continued secretly to perform the divine services under the leadership of the holy Bishop Callistus, and hid them from their pursuers. In consummation of their great charitable deeds the holy family was deemed worthy to glorify the Lord by martyrdom. The pagans beheaded the courageous confessor Valentinus the Presbyter, and the imperial gardener Asterius who had been converted by him, and the holy ascetics from Persia were arrested and given over to torture. By order of the emperor, Saints Marinus, Audifax and Habakkuk were beheaded in the year 269, and Saint Martha was drowned in a river. The relics of the holy saints are in Rome at the Church of Saint John the Hut-Dweller, and the relics of Saint Valentinus are in the Church of the holy Martyr Paraskeva. The Martyrs Valentine and Pasikrates came from the city of Durostorum, Silistria (now Bulgaria) and were soldiers under the governor Absolanus. Pasikrates was twenty-two years old, and Valentine was thirty. 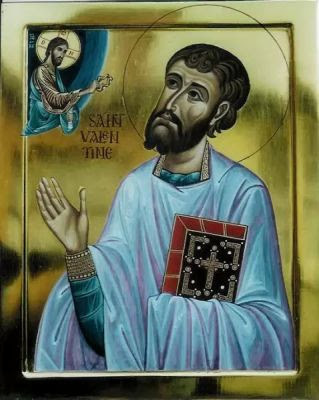 When a persecution against Christians began, Saints Pasikrates and Valentine openly confessed their faith in Christ. At the trial Pasikrates spit at the idol of Apollo, and refused to offer sacrifice. The brother of Saint Pasikrates wept and urged him merely to appear to offer sacrifice to the idols. 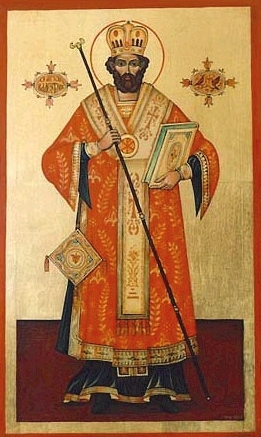 The martyr placed his hand on the sacrifice in the fire and said, “The body is mortal and burns in the fire, the soul, however, is immortal and is not harmed by these torments.” Saint Valentine also showed his readiness to suffer for Christ. When they led the martyrs to execution, the mother of Saint Pasikrates followed them and exhorted her son not to fear death for Christ. Both martyrs were tortured and then beheaded in 288. We now observe another Scout Sunday where we pause from our busy routine to remember the many contributions that the Scouting Community has made to make our world a better place to live. It is fitting that our churches especially remember the Scouts as many of our Parishes are home to Scout Troops. Answering the call to have “Duty to God”, our churches are an integral part of what makes Scouting such a valuable institution. Always remembering that “A Scout is Reverent”, these young men and their leaders offer a path to holiness that is grounded in the good works and learned skills that can only be found in Scouting. 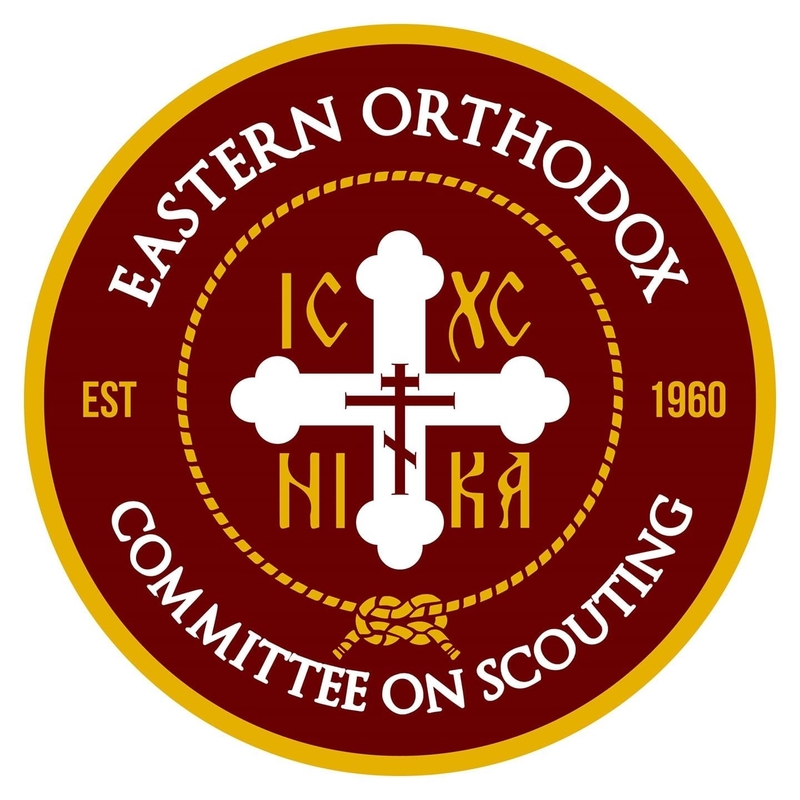 In 1960, the Standing Conference of Canonical Orthodox Bishops in the Americas [SCOBA] endorsed Scouting as viable part of their youth ministry and created the Eastern Orthodox Committee on Scouting [EOCS]. This was the first agency created by SCOBA and presently an agency under The Assembly of Canonical Orthodox Bishops in the Americas. The EOCS Executive Board encourages all Orthodox Churches to recognize and celebrate this Scout Sunday on February 10, 2019 even if their church does not sponsor a Scout unit. 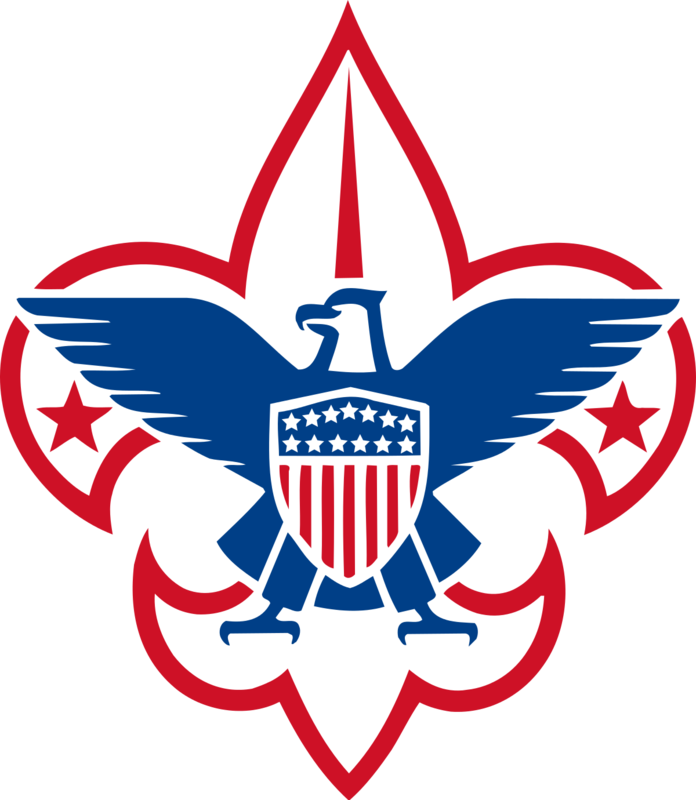 I am sure there are Scouts in nearly every Parish in the United States. Living in a world that constantly seems to want to attack the family and the ideals of Scouting, either directly or indirectly, I find our Scouting troops to be a good place to support the ideas of Reverence and Duty to God. Anyone interested in their good work can go to the EOCS website at www.eocs.org to learn more about Scouting and the Orthodox Church. This year will be the World Scout Jamboree at the Summit Bechtel Reserve in West Virginia from July 23. 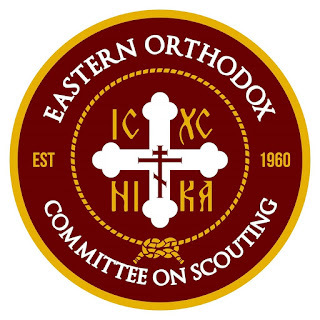 Once again the EOCS will be sponsoring an Orthodox booth, holding services and meetings with Orthodox Scout from around the country and around the world. I would encourage all Orthodox Scouts to attend and be involved at the Jamboree. Some Scout Sunday Ideas: - If your parish sponsors a Scout unit have them arrive in full uniform. - If the church does not have a Scout program, have the Scouts come in uniform. Many priests are aware of Scout Sunday and will discuss Scouting at some point of the service. 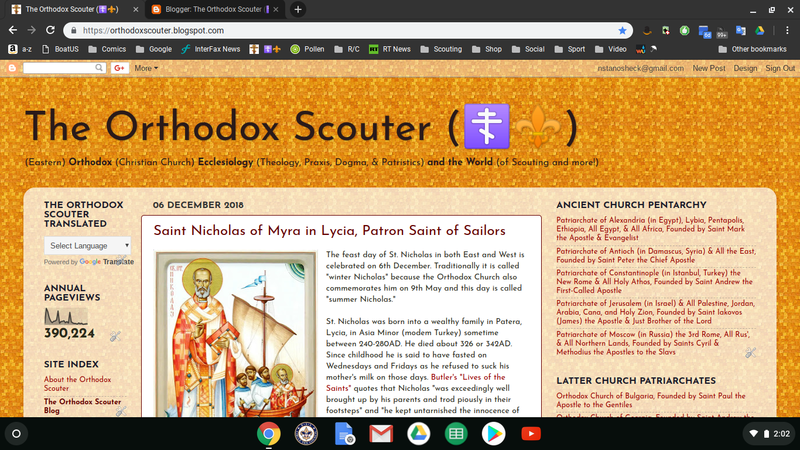 - Present Eastern Orthodox Religious Scout Awards and/or any other Scout Awards earned. - Have a Scout Display and recruitment. - Think of sponsoring or establishing a Scout unit in your parish. - Approach a local Scout unit and give them ideas for service projects which can benefit your parish and community. - Look at the many Orthodox Scout awards and encourage your Scouts to earn them. Scouting has proven to develop stronger church membership and it is a natural fit. Good Scouts make better Church members and good Church members make better Scouts. - Volunteer to assist the local Scout troop/pack/crew. - Take a collection and contribute funds to the EOCS so they can continue their good work. Think about establishing a local EOCS committee so all Orthodox Scouts in the region can gather and support one another. In North Texas (Area 2), the local EOCS committee (North Texas Eastern Orthodox Committee on Scouting) is inviting all Orthodox Scouts and Scouters (Adult Leaders), as well as all Scouts who do not have a church celebrating Scout Sunday, to attend the Divine Liturgy at the following location on February 10th, 2019 at 10:00am. 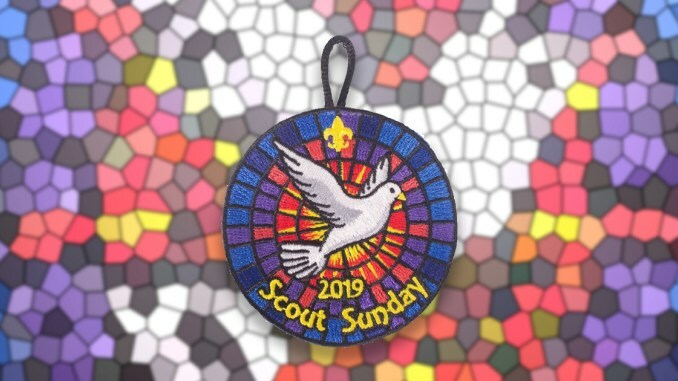 At the end of the Divine Liturgy there will be a special blessing and prayer service for all Scouts and Scouters and a cake to celebrate the solemn occasion. The Orthodox Scouter's first post of 2019 isn't even about 2019, it is all about 2018! The top 13 viewed posts on this blog in 2018 were not all from 2018, so here are 2018's 2 most popular posts authored in 2018, 2018's 7 most popular viewed posts from years previous to 2018, and the 4 most popular posts of all time that are not listed in the lists prior to it. Read them all and let us know what your 13 favorite posts from this blog are. 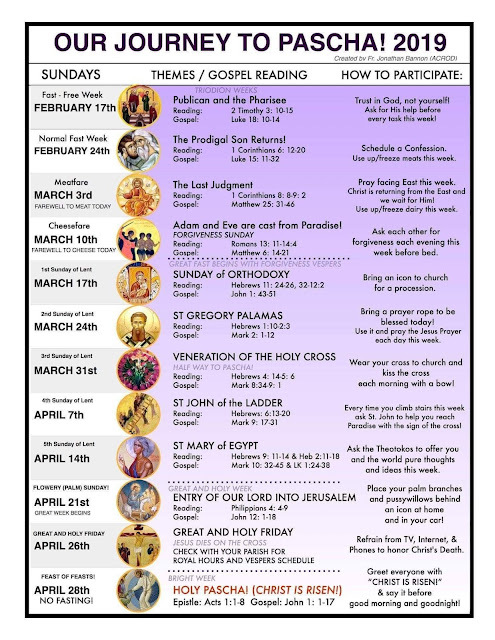 A Timeline of Church History: Tracing the birth and continuity of the Christian Church from Pentecost to the present.